‘Dorothea Tanning brought what can only be called her ‘quirky’ sensibility to the costuming of the performance. The whimsical costumes themselves embody a sense of movement, not only through the fabrics, gauzes, and veils employed, but in their fitting - itself contorted, bewitched, and ecstatic.’ Joanna Kleinberg and Rachel Liebowitz, Dorothea Tanning, Early Designs for the Stage, The Drawing Center, New York, 2010. 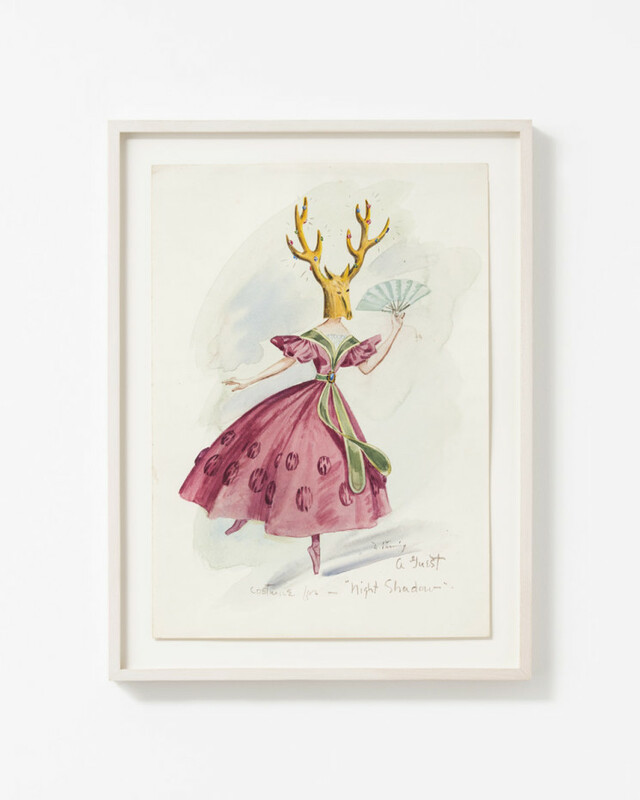 Alison Jacques Gallery presents a solo exhibition of rare ballet and theatre designs by Dorothea Tanning, dating from 1945 through to 1961, in the upstairs exhibition space. Last shown in a solo exhibition with accompanying catalogue at The Drawing Center in New York (2010), this body of work has previously not been exhibited in Europe. The series of ink, gouache and watercolour works on paper shown in London feature over twenty costumes and two set designs. While renowned for her painting, Tanning was also commissioned to create costume and set designs for a number of ballets choreographed or produced by the co-founder of the New York City Ballet, George Balanchine. Tanning had met Balanchine at the Julien Levy Gallery, which was a popular gathering place for Surrealists living in New York at the time and home to her first solo gallery show in 1944. Tanning described their first meeting as ‘momentous’, and went on to collaborate with Balanchine on his productions of Night Shadow (choreographed by Balanchine and premiered at the Metropolitan Opera House in New York in 1946); The Witch(choreographed by John Cranko and premiered at the Royal Opera House, Covent Garden in London in 1950); and Bayou (choreographed by Balanchine and premiered at New York City Center in 1952). Also featured are watercolour designs for unrealised ballets from the late 1940s - early 1950s, and two later watercolours related to theatre costumes Tanning designed for Jean Giraudoux’s play Judith (directed by Jean-Louis Barrault at his avant-garde Théâtre de France at l’Odéon in 1961, with sets designed by Max Ernst). Exceeding their practical intention as instructions for set and costume designs, the works in Night Shadows embody a sense of movement and fantasy. The fanciful characters we see in Tanning’s images show the artist exploring costume as her medium, drawing from her early experience rendering fashion advertisements as a young artist. Inspired by the productions themselves, Tanning’s costumes convey narratives of transformation and push the limits of the theatrical. They often feature uncanny and outlandish face masks or headdresses, like a deer’s head with jewelled antlers (Night Shadow), a tentacled octopus (The Witch) and a bird-like figure with a dramatic spray of head and tail feathers (Bayou), engulfing and transfiguring the heads of the dancers who might wear them. In costumes that define the bodies of dancers or drapery that flows throughout the space of a theatre set, these works represent the artist’s visual exploration of the expressive potential of fabric, which Tanning once described as ‘supple, sly, always moving…’. This theme is introduced in her early paintings such as Eine Kleine Nachtmusik, (1943, Collection of Tate, London) and later realised in the artist’s series of fabric sculptures from the late 1960s and early 1970s. The works gathered here also celebrate dance, which is a subject that recurs throughout Tanning’s career. For instance, she realised four works entitled Tango over a 50-year period (1939 – 1989), and included the iconography of ballet in the otherwise completely fantastical painting La Chienne et sa muse (1964), in which a dog is depicted en pointecomplete with ballet shoes. In this sense, they are part of Tanning’s career-long interest in the interplay between bodies, material and space. Dorothea Tanning was born in Galesburg, Illinois (1910), and died in New York (2012) aged 101 years. Major solo shows during her lifetime included Philadelphia Museum of Art, Philadelphia (2000); Camden Arts Centre, London (1993); Malmö Konsthall, Malmö (1993); and Centre Pompidou, Paris (1974). More recently, Tanning’s work has been included in a number of thematic museum shows: Disobedient Bodies, Hepworth Gallery Wakefield, Yorkshire (2017); The Beguiling Siren is Thy Crest, Museum of Modern Art, Warsaw (2017); Making & Unmaking: An exhibition curated by Duro Olowu, Camden Arts Centre, London (2016). Tanning’s work has been acquired by museums worldwide, including The Whitney Museum of American Art, New York; Tate, London; San Francisco Museum of Modern Art, California; Moderna Museet, Stockholm; Philadelphia Museum of Art, Philadelphia, and Centre Pompidou, Paris. A major solo museum exhibition of Dorothea Tanning curated by Alyce Mahon will open at the Museo Nacional Centro de Arte Reina Sofia, Madrid in 2018 and Tate Modern, London in 2019.